Las Vegas, Oct 3 (IANS) Stephen Paddock, the shooter who killed 59 people and injured more than 500 at a music concert here, had stockpiled a total of 42 firearms in his 32nd floor hotel room and at his home, 130 km away from the site of the massacre, officials said. Authorities found 19 weapons from his home in Mesquite, a small city in Nevada, and 23 in the Mandalay Bay Hotel room in Las Vegas from where Paddock opened fire on 22,000 people attending a concert at a country music festival on Sunday night, said Clark County Assistant Sheriff Todd Fasulo on Monday. With hundreds of victims still hospitalized, officials said the death toll was likely to rise. Paddock, 64, also had in his possession two other devices that could transform his semi-automatic weapons into automatic ones, Fasulo was quoted as saying by CNN. Police found in the gunman’s car several kilos of ammonium nitrate, a substance used in the manufacture of explosives. 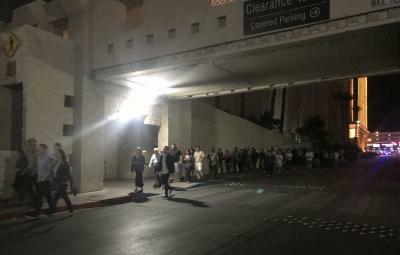 The shooter spent his last moments firing desperately at the police through the door of his room at the hotel, said Clark County Sheriff Joseph Lombardo. He also fired at a security guard and a SWAT team, comprising six agents, who were combing the floors of the hotel looking for him, and killed himself before he could be apprehended. Police said they were still working to establish the motive behind the deadliest mass shooting in the US history. Investigators said the gunman had no terror link and never faced any notable criminal charges, despite a claim from the Islamic State for the attack. Even the gunman’s brother had no answers. “We’re still just completely befuddled. Dumbstruck,” Eric Paddock told CNN. Several vigils were held on Monday night to honour the victims of the shooting. Communities came out in Reno, Las Vegas and at the campus of University of Nevada.